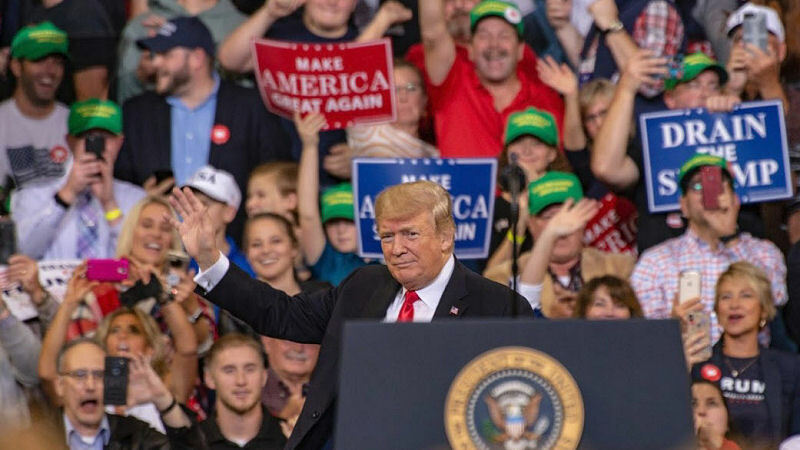 President Trump held another KAG2018 rally in Council Bluffs IA to a large crowd in the mid-America center. Chants rang out to ‘Lock Sen. Dianne Feinstein up’. The president announced his plan to boost Iowa Ethanol production to help farmers. Another GREAT MAGA KAG 2018 Trump Rally in Council Bluffs IA as Trump supporters chant “lock her up” referring to Sen. Dianne Feinstein. His loudest applause came as he continued his Democrat bashing for attempting to sink the Kavanaugh nomination. Trump and GOP leaders say the failed effort energized Republican voters. Republicans have long been considered less energized than Democrats. Speaking to a crowd of thousands, Trump said he was delivering a promise he’d made to Iowa voters years ago when he campaigned ahead of the state’s caucuses. Promises made, promises kept, president Trump said. He said if Democrats take control of Congress next month, they will seek to roll back his efforts.